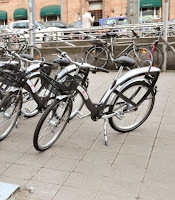 Gandia, Spain is the one of the first cities to adapt its bike-sharing service, labici, for persons with disabilities. With 500 bikes at 40 stations, the municipality decided to introduce bicycles for those with disabilities as a trial program. According to laprovincias, the Councillor for Traffic and Mobility for the City of Gandia, Vicent Mascarell, is proud of his city's "commitment to equality" to persons with disabilities." A successful experiment here could lead to more bike-sharing services following Gandia's lead. In the bike-sharing world as May winds down, Hawaii B-cycle (Kailua, USA), Boulder B-cycle (Boulder, USA) and StadtRad Berlin (Berlin, Germany) started today. 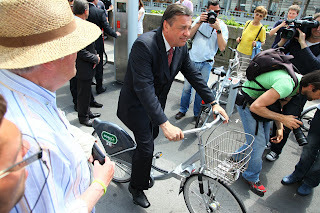 Capital bIXI (Ottawa, Canada) started on Wednesday and Madison B-cycle (Madison, USA) starts on Sunday. At this rate of new service launches, The Bike-sharing World Map will soon be rolling with more bike icons than blank space! 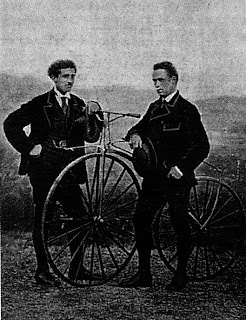 Happy Bike to Work Day for readers in the United States! Happy fourth birthday to The Bike-sharing Blog! Where has all the time gone? The Bike-sharing Blog was born four years and 275 posts ago today. That’s sharing about 69 posts per year. Russell and I combined don’t even brush our teeth that often in a year. As we enjoy the sugary icing of the Blog’s birthday cake, we thank you for your continued reading of our little Blog. And here’s to everyone who is making bike-sharing happen in their city or town, campus, park, or office park! We look forward to all the exciting developments on which we will be writing about in The Bike-sharing Blog’s fifth year. p.s. – Paul is the good-looking guy with curly hair on the left and Russell is debonair guy on the right. And no, we’re not wearing spandex. Capital Bikeshare (Washington, DC & Arlington, VA - USA) launched its dashboard, or snapshot of key service performance measures, today. The dashboard is full of useful data from the service and I believe one of the best sites of its kind provided by any government offering a bike-sharing service. Data on a public service should be easily accessible and informative and this site certainly is. (Washington, D.C.) Capital Bikeshare launched a new website today that provides a wealth of performance data about the bikesharing program, including monthly statistics for ridership, membership, customer service, fleet performance and safety. 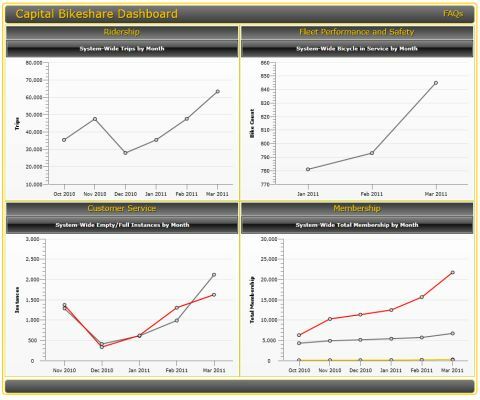 The Capital Bikeshare dashboard is available at cabidashboard.ddot.dc.gov. It was developed by the District Department of Transportation (DDOT) as part of the agency’s continuing effort to improve transparency and release performance data related to its transit services. The dashboard features 18 individual performance metrics, which fall under four categories: Ridership, Fleet Performance and Safety, Customer Service and Membership. 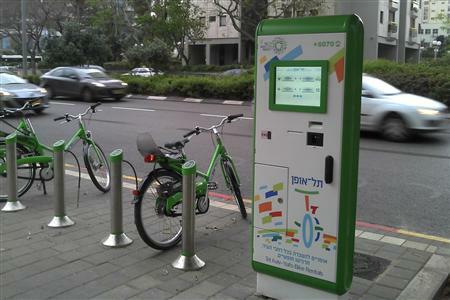 Performance metrics include: Trip Origin/Destination by Station; Trip Origin/Destination by Municipality; Fleet Maintenance (Number of bikes inspected/repaired) per month; Rebalancing (Number of times bicycles picked up and dropped off at stations); and total number of users. The data covers the entire Capital Bikeshare system, including the District and Arlington. Through this portal, the public will be able to review system-wide information, compare performance metrics by different time intervals, and download data for individual custom analysis. In order to guide users through the site, DDOT has prepared an online Dashboard Tutorial, which is available on DDOT’s YouTube Channel, providing a voice-narrated, step-by-step overview of how to use the Dashboard and maximize its features. Preceded by the Circulator Dashboard, the first dashboard of its kind in the Washington Metropolitan region, the Capital Bikeshare dashboard’s creation is a reflection of DDOT’s continued commitment to transparency, government accountability and best practices. The information and data contained in the dashboard is scheduled to be updated on a monthly basis. For any inquiries about the dashboard, users are asked to contact DDOT via email at cabidashboard@dc.gov. Capital Bikeshare is the product of a unique public/private partnership between DDOT, Arlington County and Alta Bike Share. The two jurisdictions worked closely with Alta Bicycle Share to develop the program in the fall of 2010, offering regional service with 1,100 bikes and 114 stations. 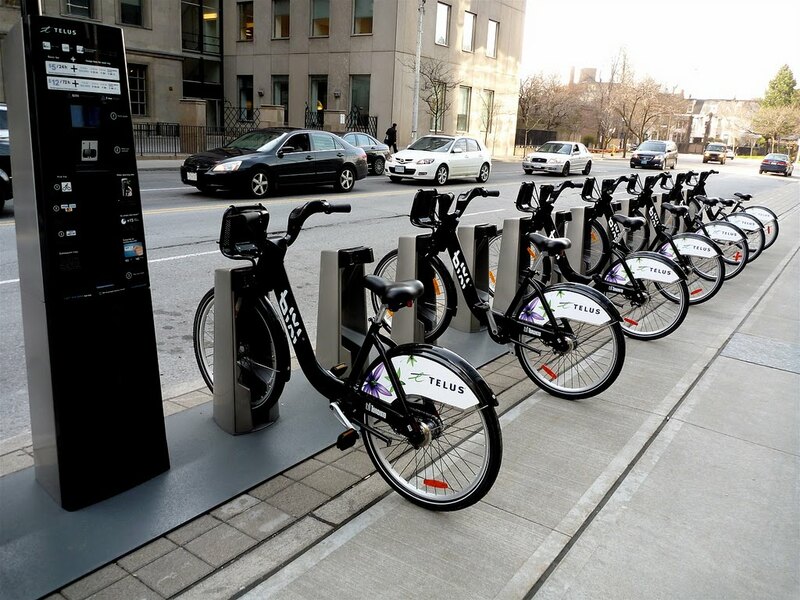 Based on the initial success of the program, both jurisdictions plan to add additional stations and bicycles to the system by the end of the year. 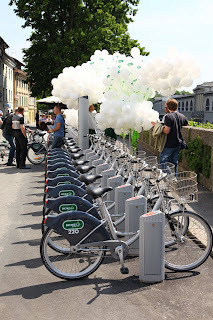 BICIKE(LJ), Slovenia's new bike-sharing service, launched May 12th in the capital of Ljubljana. Its name is a combination of a word "bicikel" (which I'll let you guess what it means in English) and "LJ", which is the registration motor vehicle mark and initial letters of Ljubljana. 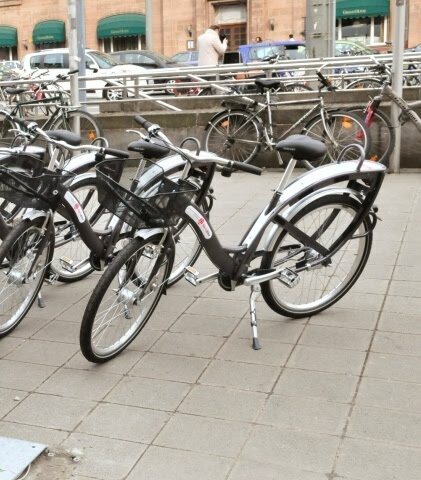 Customers will be able to pick up one of 300 bicycles from any of the 31 stations covering an area of approximately 12 square kilometers in a network where the terminals are not separated by more than 500 meters. The population of Ljubljana is 275,000 with at least 100.000 daily commuters and 45,000 students. The service is a joint venture of the Municipality of Ljubljana and the advertising company Europlakat (a partner of JCDecaux in Slovenia). Even before the launch, 1,633 advance registrations had been made through their website -- http://en.bicikelj.si/. Registration is available for a year at three euros and a week at 1 euro. The first hour is free of charge, the second is 1 euro, third is 2 euros, and each additional hour is 4 euros. The service is operable 24 hours per day throughout the year. 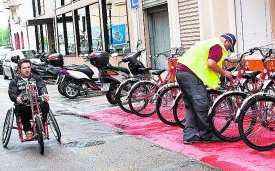 Special thanks to Janez Bertoncelj, Ljubljana's cycling coordinator for assistance with this article. Because the Northern Hemisphere is basking in warm weather, bike-sharing systems are blooming all over that part of the world. The beginning of May has brought the official opening of Tel-Ofun in Tel Aviv, Israel. Watch video. 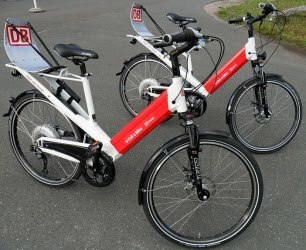 Later this week Nuremberg's NorisBike starts on May 6th. This is another system using neXt bike technology. 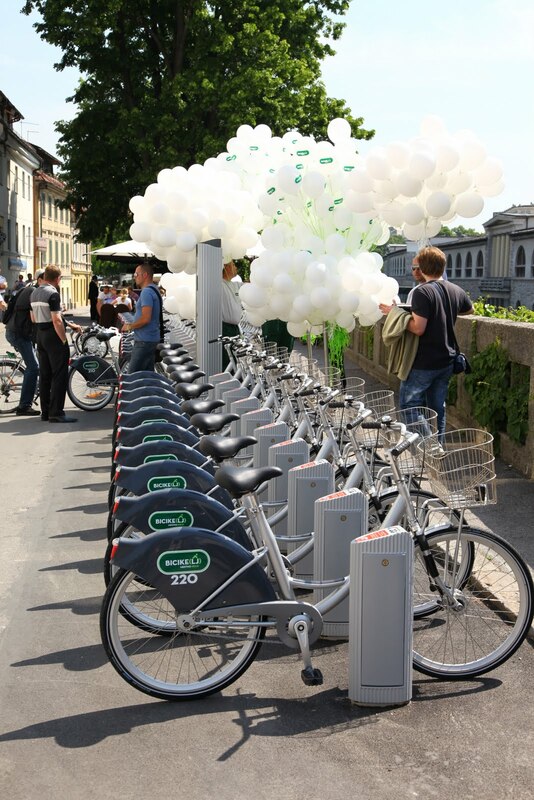 Bike-sharing is expanding and evolving in Germany. Many programs are now establishing specific location docking stations and adding subscriber card and credit card access as well as telephone access to the bikes. Berlin's new Deutsche Bahn StadtRAD begins May 20th. 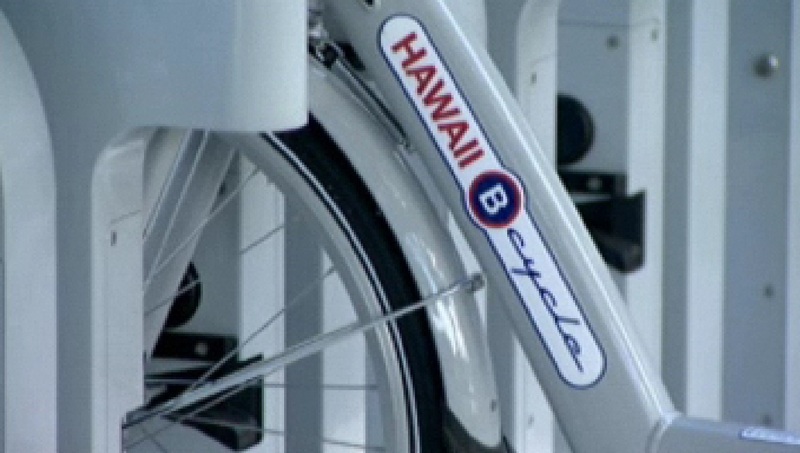 May 20th is also the official start date for Hawaii B-cycle although the two stations are now in use. 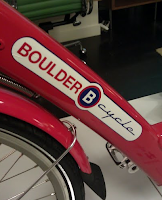 Boulder B-cycle also starts on May 20th opening with 12 stations and expanding to 15 with 150 bikes by the end of summer. Keep your eyes open, because there are more buds of bike-sharing systems ready to show their pedals and blossom into full service.